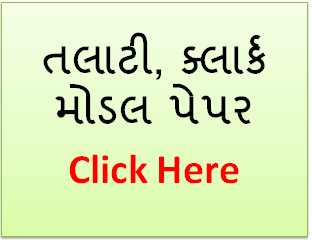 Get the Gujarat Talati Model Paper 2018 online for free at OJAS Gujarat. Get solved Model paper for Panchayat Talati, Junior Clerk & Other Class-3 exam. Model question papers help candidates identify the important and frequently asked questions and give them a good practice for their aptitude and knowledge. How Model papers help students? Practice makes the work successful; The candidates also have to practice very well for the success of the exam. Here are some model papers for preparation of exam which will be very useful in preparing you for the exam. By reading these papers, students also realize the familiarity in sample papers. So, students can really understand what not to ignore and which to select. Talati Exam Model paper with Answers PDF present here. Aspirants can get Talati Clerk Study Material for free of cost. Refer to the Gujarat Panchayat Talati & Clerk Syllabus and Exam Pattern for perfect preparation. Check ojas.gujarat.gov.in for complete details regarding Talati Exam. Talati Call Letter, Answer Key and Results also available on our site. Aspirants can also give comments in the comment box to clear your doubts regarding any exam.